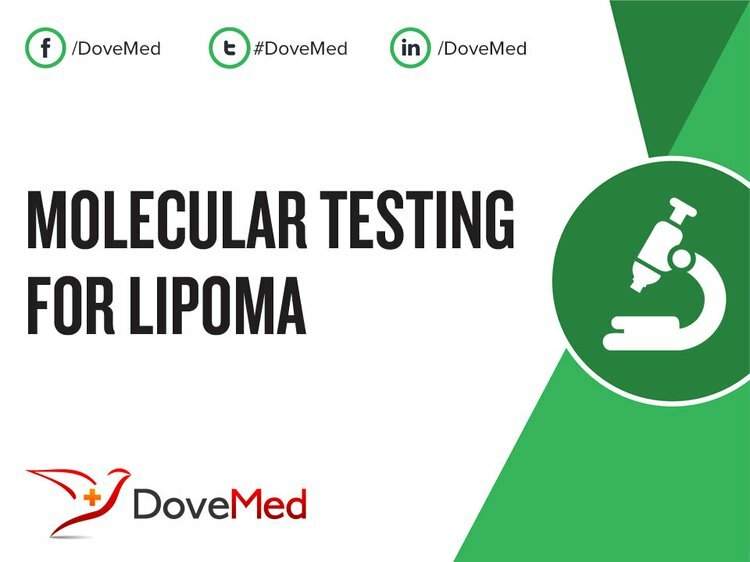 Molecular Testing for Lipoma is a genetic test that is helpful in aiding a diagnosis of lipoma. The lab test results may also be subsequently useful in taking appropriate treatment decisions. The methodology used for lipoma may vary from one laboratory to another. What are the Clinical Indications for performing the Molecular Testing for Lipoma Test? How is the Specimen Collected for Molecular Testing for Lipoma? What is the Significance of the Molecular Testing for Lipoma Result? Manor, E., Sion-Vardy, N., Joshua, B. Z., & Bodner, L. (2011). Oral lipoma: analysis of 58 new cases and review of the literature. Annals of diagnostic pathology, 15(4), 257-261. Paškauskas, S., Latkauskas, T., Valeikaitė, G., Paršeliūnas, A., Svagždys, S., Saladžinskas, Z., ... & Pavalkis, D. (2010). Colonic intussusception caused by colonic lipoma: a case report. Medicina (Kaunas), 46(7), 477-481. Coll, J. P., Ragsdale, B. D., Chow, B., & Daughters, T. C. (2011). Best cases from the AFIP: lipoma arborescens of the knees in a patient with rheumatoid arthritis. Radiographics, 31(2), 333-337. Kaur, R., Kler, S., & Bhullar, A. (2011). Intraoral lipoma: Report of 3 cases. Dental research journal, 8(1). Mentzel, T., Palmedo, G., & Kuhnen, C. (2010). Well-differentiated spindle cell liposarcoma (‘atypical spindle cell lipomatous tumor’) does not belong to the spectrum of atypical lipomatous tumor but has a close relationship to spindle cell lipoma: clinicopathologic, immunohistochemical, and molecular analysis of six cases. Modern Pathology, 23(5), 729-736. Paulli, M., Arcaini, L., Lucioni, M., Boveri, E., Capello, D., Passamonti, F., ... & Berti, E. (2010). Subcutaneous ‘lipoma-like’B-cell lymphoma associated with HCV infection: a new presentation of primary extranodal marginal zone B-cell lymphoma of MALT. Annals of oncology, 21(6), 1189-1195. Van Itallie, C. M., Tietgens, A. J., Aponte, A., Fredriksson, K., Fanning, A. S., Gucek, M., & Anderson, J. M. (2014). Biotin ligase tagging identifies proteins proximal to E-cadherin, including lipoma preferred partner, a regulator of epithelial cell–cell and cell–substrate adhesion. J Cell Sci, 127(4), 885-895. Wood, J., & Henderson, R. G. (2014). Peripheral intrapulmonary lipoma: a rare lung neoplasm. The British journal of radiology. Debnath, S. C., & Saikia, A. (2010). Lipoma of the parotid gland extending from the superficial to the deep lobe: a rarity. British Journal of Oral and Maxillofacial Surgery, 48(3), 203-204.